Investigation is made of one of the self-similar regimes in the problem of a crystal growing from a pure melt with an isothermal surface. This regime is shown to exist only in the case of two-dimensional, cylindrical, or spherical geometry of the crystal and also when a two-dimensional crystal grows on a surface isometric to the surface of revolution. 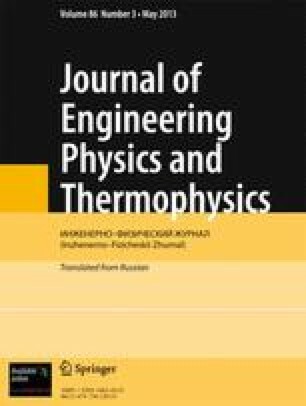 Modeling of the spherical crystal growth by two-dimensional crystallization on the surface of revolution is discussed. Institute of Mathematics and Mechanics, Ural Branch of the Russian Academy of Sciences, Ekaterinburg, Russia. Translated from Inchenerno-Fizicheskii Zhurnal, Vol. 63, No. 4, pp. 468–472, October, 1992.